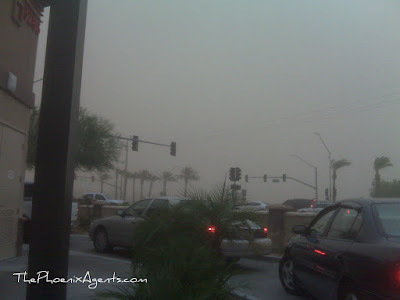 Last night we had a dust storm as big as I've seen in a long, long time. I remember being a kid, and my dad would take me up to the roof of the house, where we would watch a brown wall move across the sky. When the wind started to pick up, we'd head back inside & watch the storm through the windows. Last night's storm was just like that - amazing. When my older son & I left the house at 5:45, we had blue skies above us but could see dark skies to the west. This picture was taken at 5:59 (yes, that's BEFORE sunset!) from the In n Out drive-through with my blackberry (and not touched up at all).